House and time at Malvern: No 1, 1888 - 1889. Died: 23 March 1918 aged 47 in France. Killed in action. Born: 18th December, 1871 – New Mill, Elgin. Son of Colonel Charles James and Mary Johnston, Lesmurdie, Elgin. Woollen Manufacturer; 3rd Batt. Seaforth Highlanders 1891; Captain 1895; served with them in the South African War 1899—1901. Great War, 1914, Recruiting Officer; Lieut.-Colonel 6th Bn. Seaforth Highlanders. Killed in action, March 23, 1918 near Beaumetz; D.S.O. T D, Despatches (2). Husband of Mabel Frances Irene Ryan (formerly Johnston), of 1, Brompton Square, London. 'After leaving School he joined his father in business as a woollen manufacturer, at Elgin, Scotland. At the same time he joined the local Volunteer Battalion of the Seaforth Highlanders, in which he was gazetted 2nd Lieutenant in 1891 and Captain in 1895. He took the regimental service Battalion out to South Africa, and was gazetted Hon. Captain in the Army, attached to Scottish Horse in April 1902, and re-joined his home unit as Adjutant in October 1902, and was subsequently transferred to Scottish Horse as Major. 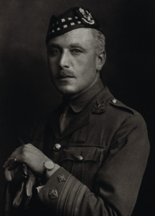 In 1914 Major Johnston, who had retired previous to the War, was appointed Recruiting Officer for Morayshire, Scotland. In 1915 he was asked to raise a regiment, the 2/6th Seaforth Highlanders. In this task he was successful, and he commanded the regiment both in Elgin and at Ripon Camp till he was sent to France in Jan. 1917. He joined the 6th Seaforth Highlanders as second in command, and was with the Battalion and was temporarily commanding when he was killed, on March 23rd, 1918. He was awarded the D.S.O. for work he did during the 21st—23rd March, 1918, and was twice mentioned in despatches. Major Johnston was first reported missing on March 23rd, and he has since been presumed to have been killed on that date.' (Malvernian, Nov 1919).